"For the first time in a long time, I felt that going to the theatre was worth $8. In fact, after the opening battle scene, I remember thinking, 'That's worth eight bucks if I die right now.' Fortunately, I survived to see the rest of the movie, which was all profit after that." It's even better in Digital. I ended up seeing it once on Thursday and twice yesterday! As a reward, the Dreamweaver team went together in the afternoon. Then, Mer and I had tickets to a Digital screening, so I took her again. Couldn't have done it without her, if you know what I mean! What a gnarly, scary, awesome movie! It definitely ranks up there with the best. 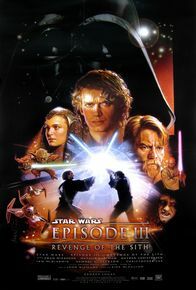 Episode III is kindof hard to categorize, because it's the 'keystone' movie between two very different trilogies. Brilliance, really. Never pontificate about killing your arch enemy. Do or do not. If you are told to wait on a fiery lava planet for your safety, don't believe it. If someone tells you that they've studied the dark side, chances are that they are a pretty good liar. Maybe they have a few tricks (or a lightsaber) up their sleeve. If you turn to the dark side in order to save someone's life, don't, like, try to kill that person. Everyone has a moment, while watching Episode III, when the entirety of the saga hits home for them. For me, it didn't sink in until after the third viewing, when Mer and I got home and were trying to figure out what to do with ourselves. It was a choice between playing the game, or watching the DVD that came with the soundtrack. We decided to watch the hour-long series of vignettes called "A Musical Journey". See, for me, the saga was as much about the music and the sound as it was about the visuals. When we didn't have the movies to watch, my brother and I would play the soundtrack over and over. So, to see the two trilogies flash before me, set to the most gripping of the soundtrack selections, was an emotional ending to two days of shock. Yes, my advice to you is: see it again, this time in Digital, and bring your buddy!